A politician and statesman, Khawaja Nazimuddin was born on 19 July 1894 in Dhaka, Bengal (East Pakistan) into the family of the Nawabs of Dhaka. He received his early education from Dunstable Grammar School in England, then moved to Aligarh Muslim University. Subsequently he went to Trinity Hall, Cambridge in England for his higher education. After returning to British India, he became involved in politics in Bengal. He was the Chairman of Dhaka Municipality from 1922 to 1929. He lost the 1937 provincial election in East Pakistan to A. K. Fazlul Huq. In the arena of provincial politics, Nazimuddin was initially the Education Minister of Bengal, but climbed the ranks to become the Chief Minister of the province in 1943. Sir Khawaja also became the head of the Muslim League in Eastern India. He set up a committee, Basic Principles Committee in 1949 on the advice of Nawab Liaquat Ali Khan to determine the future constitutions of Pakistan. Upon the formation of Pakistan, he became an important part of the early government. After the early death of Quaid-e-Azam Muhammad Ali Jinnah, Nazimuddin succeeded him as the Governor-General of Pakistan. At this point in time, the position was largely ceremonial, and executive power rested with the Prime Minister. On state religion he spoke against secularism, “I do not agree that religion is a private affair of the individual nor do I agree that in an Islamic state every citizen has identical rights, no matter what his caste, creed or faith be". In 1950 he declared “Pakistan would remain incomplete until the whole of Kashmir is liberated”. The first Prime Minister of Pakistan, Liaquat Ali Khan was assassinated in 1951, and Nazimuddin became the next Prime Minister. During Nazimuddin's time as Prime Minister, Pakistan saw a growing rift within the Muslim League, especially between Punjabi and Bengali groups, as those were the two largest ethnic groups of Pakistan, but were separated by India. On 21 February 1952, a demonstration in the Language movement demanding equal and official status to the Bengali language turned bloody, with many fatalities caused by police firings. This demonstration was held when he declared Urdu the National Language of Pakistan, following the previous statement of Quaid-e-Azam Muhammad Ali Jinnah that Urdu shall be 'one and only' language of Pakistan. During his time in office, a framework was begun for a constitution that would allow Pakistan to become a republic, and end its Dominion status. 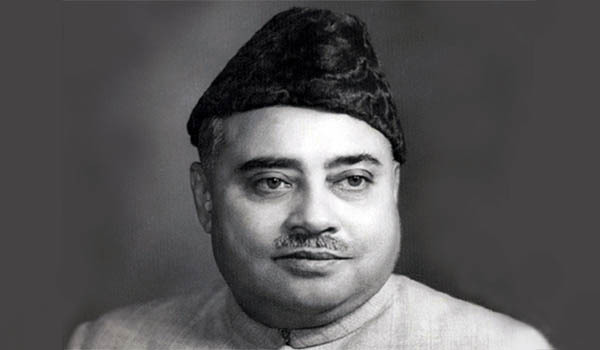 Progress was made, but Nazimuddin's time as Prime Minister would be cut short in 1953. In 1953, a religious movement began to agitate for the removal of the Ahmadi religious minority from power positions, and demanded a declaration of this minority as non-Muslims. Nazimuddin resisted such pressures; but mass rioting broke out in Punjab against both the government and followers of this religious minority. He responded by changing the governor of Punjab to Feroz Khan Noon, but the decision came late. In the same year Governor General Ghulam Muhammad dismissed the government of Nazimuddin. Ghulam Muhammad, the Governor-General, asked the Prime Minister to step down. Sir Khawaja refused, but Ghulam Muhammad got his way by invoking a reserve power that allowed him to dismiss the Prime Minister. The Chief Justice, Justice Muhammad Munir, of the "Federal Court of Pakistan" (now named as the Supreme Court of Pakistan), did not rule on the legality of the dismissal, but instead forced new elections. On 17 April 1953, Nazimuddin was dismissed and forced out of the government, and conceded his defeat in the 1954 general elections, and was succeeded by another statesman from East Pakistan, Muhammad Ali Bogra. The dismissal of Sir Khawaja, the Prime Minister, by the Governor-General, Ghulam Muhammad, signalled a troubling trend in Pakistan’s political history. Khawaja Nazimuddin was appointed a Companion of the Order of the Indian Empire (CIE) in 1926, and was knighted in 1934 by the King-Emperor, George V, when he was appointed a Knight Commander of the Order of the Indian Empire (KCIE). The Nazimabad and North Nazimabad suburbs of Karachi and Nazimuddin Roads of Dhaka and Islamabad have been named in honour of Sir Khawaja Nazimuddin. In his honour, the Pakistan Post issued a commemorative stamp in accordance to his respect. After a long illness, Khawaja Nazimuddin died on 22 October, 1964 at the age of 70, and was given a state funeral. He is buried at Suhrawardy Udyan, in his hometown of Dhaka.